— Do High Arches Cause You Trouble? You have been experiencing pain within your feet for many years now and having tried multiple home remedies, you have finally decided now is the time to do something about it. After working long hours, you go home to soak your feet in a warm bath but your pain and aches just don’t seem to be getting better. 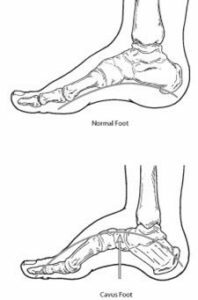 After a visit to your local podiatrist you have been told that you have developed a pes cavus foot type also known as high arches. So what exactly is a pes cavus foot type? Cavus feet occur in individuals that have a very high arches. High arches can cause excessive amounts of pressure through the balls and heel of your feet during standing, walking and running. Quite often you will experience pain and instability with high arches. Typically it may develop at any age and can occur in either one or both feet. So who is at risk of developing high arches? There are often 2 main causes; hereditary structural abnormality and neurological from medical conditions such as Cerebral Palsy, Charcot- Marie- Tooth disease, Spina Bifida, Polio, Muscular Dystrophy and Stroke. Quite often in neurological cases, the progression of high arches may worsen over time. After discussing the causes that are associated with your high arches, one of our friendly podiatrists will provide you with appropriate treatment options for your feet to assist in reducing your pain levels.